Marina Inn at Grande Dunes in Myrtle Beach is excited to welcome a new member to our stellar team. We’re happy to have a new Executive Chef, Robert Astraikis, creating masterpieces and bringing a whole new flavor to the kitchen in our award-winning on-site restaurant, WaterScapes. Chef Astraikis is originally from New York and has spent most of his career polishing his skills in areas of southeast North Carolina. Chef Astraikis says his inspiration for cooking comes from his mother. With a natural flair and passion for all things food, he graduated from the Culinary Institue of America in New York. Chef Astraikis is bringing in bold flavors and highlighting Southern European cuisine in the new dishes for our onsite restaurant, WaterScapes. 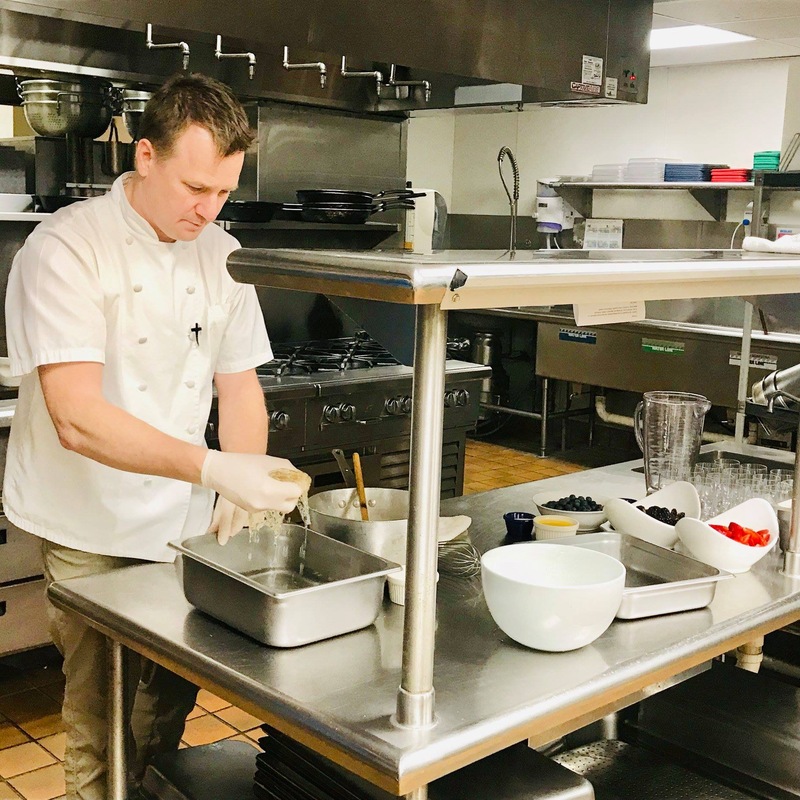 In order for our guests to familiarize themselves with our new Executive Chef, we had him answer a few personal questions such as details on his cooking style and what ingredients are a must have in his kitchen. Q: With all of this experience, what is your cooking style and your favorite cuisine? Q: Who influenced you to become a chef? Q: What are the top five ingredients that you must have in the kitchen at all times? Q: What is your own personal favorite meal to prepare? With over 27 years of experience, we are incredibly excited to welcome Chef Astraikis to our team at WaterScapes Restaurant! He has already created brand new menu items for both the WaterScapes dinner menu and Reflections Cafe Happy Hour menu. Our dinner menu at WaterScapes Restaurant is making some room for new creations by Chef Astraikis! But don’t worry, you can still order your favorite WaterScapes classics like Diver Scallops, Filet Mignon, and Shrimp & Grits. Chef Astraikis’ signature style of cooking highlights Southern European cuisine featuring Indian and Hispanic influences. This combination of flavor and pizazz is just one of the reasons Marina Inn at Grande Dunes is thrilled to have Chef Astraikis as the head of our team at WaterScapes. Some of the new dishes include Chili Shrimp, Coconut Clams, Seafood Paella, Moroccan Chicken, and so much more! If you happen to have food allergies or diet restrictions, we offer a variety of vegetarian and gluten-free menu items for you to choose from. And for those with a sweet tooth, finish your meal the right way with a decadent treat! Choose from items like our rich Triple Chocolate Mousse Cake and a delicious Honey Lavender Creme Brulee. After spending the day exploring Myrtle Beach, come check out our brand new menu at Reflections Cafe. Reflections Cafe is open for Happy Hour on Monday through Friday from 4 p.m. – 7 p.m. Some of the yummy new menu items include a Pork Milanese and a Short Rib Ragu that will pair perfectly with any style cocktail. Happy Hour also includes reduced prices on beer, wine, house brand drinks, and select appetizer plates. Take your appetizers and cocktail outside and enjoy spectacular views of the Intracoastal Waterway. Talk about the perfect way to unwind! When you book your next vacation to Myrtle Beach with the award-winning 4-star resort Marina Inn at Grande Dunes, check out our specials page to see what kind of deals we’re offering. And make sure to visit WaterScapes Restaurant for a truly rewarding culinary experience from Chef Astraikis and his team! For an award winning upscale dining experience at one of the best seafood restaurants in Myrtle Beach, you won’t even have to step foot off the property. WaterScapes, located at Marina Inn at Grande Dunes, showcases a “Farm to Table” style approach using fresh, local ingredients. They are conveniently open for breakfast, lunch and dinner. Breakfast includes all the favorites such as omelettes, Belgian waffles, french toast. Some of the lunch options are salads, burgers, Grilled Swordfish Tacos and a Fried Flounder Sandwich. 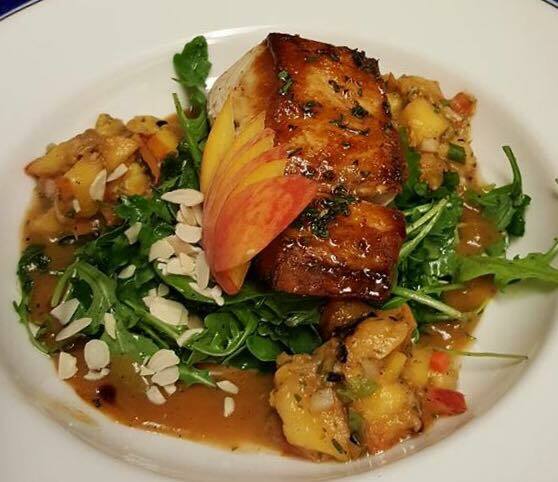 Their dinner menu features selections such as Filet Mignon, Pan Seared Diver Scallops, and a Berkshire Pork Chop. Enjoy the ambience of the candlelight glow indoors or take your dining experience outdoors with amazing views of the pool, marina and Intracoastal Waterway. Right around the corner from Marina Inn at Grande Dunes is a brand new restaurant – Blueberry’s Grill. 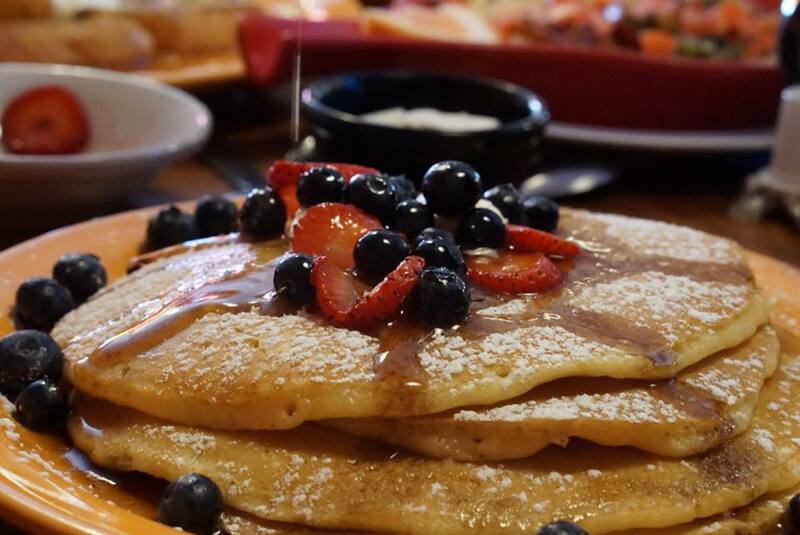 They offer an eclectic menu of breakfast and lunch items, serving everything from Omelettes, Breakfast Burritos and Pancakes to Halibut Primavera, Soy Glazed Salmon and Shrimp and Grits. Breakfast is served all day and during their weekend brunch they offer a Build Your Own Bloody Mary Bar where you can concoct your own perfect drink to ease into your day. You can enjoy dining indoors or soak up the sun and eat on their outdoor patio! 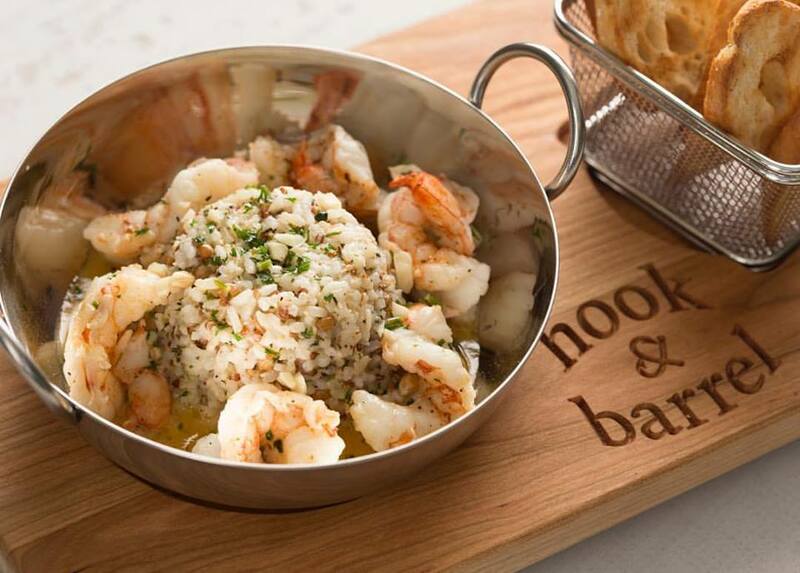 Hook and Barrel is a modern restaurant that serves up fresh, sustainable, local seafood. Their menu features a whole steamed section of delicacies from the sea including fresh oysters, clams, and shrimp. They also offer a variety of other items including Bone-in Filet, Peach Pork Tenderloin, and flatbreads. The restaurant itself has unique touches on everything from the presentation of food – the complimentary pimento cheese is served on a wooden cutting board in the shape of South Carolina – to their decor of jellyfish lights hanging from the ceiling over the bar. And afterwards, make sure to grab a glass of wine to sip on while you relax and rock on one of their giant swings. Located on 21st Avenue North and Ocean Boulevard, Strong Waters is a prohibition-era inspired bar and restaurant that utilizes a ‘Farm to Shaker’ style approach for their libations and ‘Farm to Table’ method for their menu, using only the freshest, local ingredients. 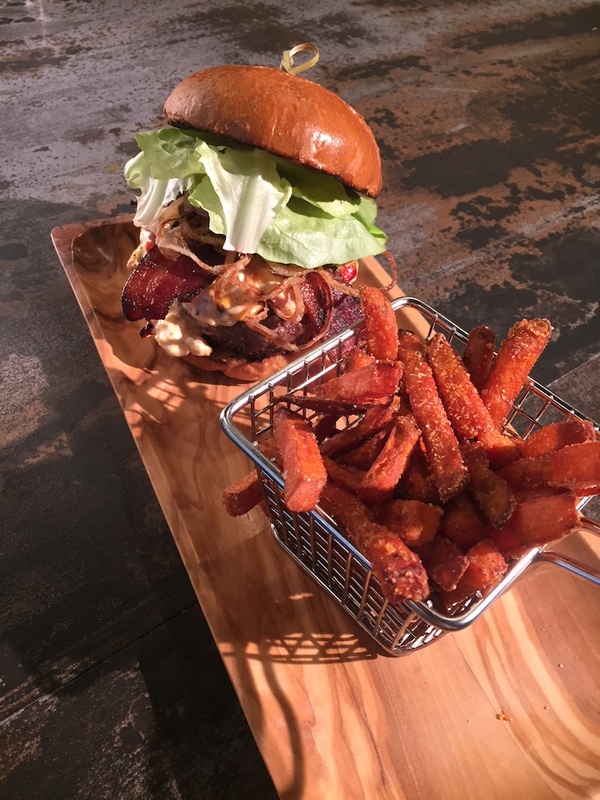 Their menu showcases their ‘Lowcountry cuisine with a twist’ that includes specialties such as Shrimp & Grits Soul Rolls, Pork Belly Tacos, a Butcher Block Burger, and a Short Rib. Make sure to try one of their handcrafted specialty cocktails to pair with your meal such as the Smokin’ Oldie, Honeysuckle Mule or Gin Slap. Strong Waters Bar also offers Brunch on Saturdays and Sundays which features a Signature Stuffed Waffle, Cast Iron Pancake, Shrimp & Grits, and more – as well as spiked coffees, a Bloody Mary Bar, and Bottomless Mimosa specials! 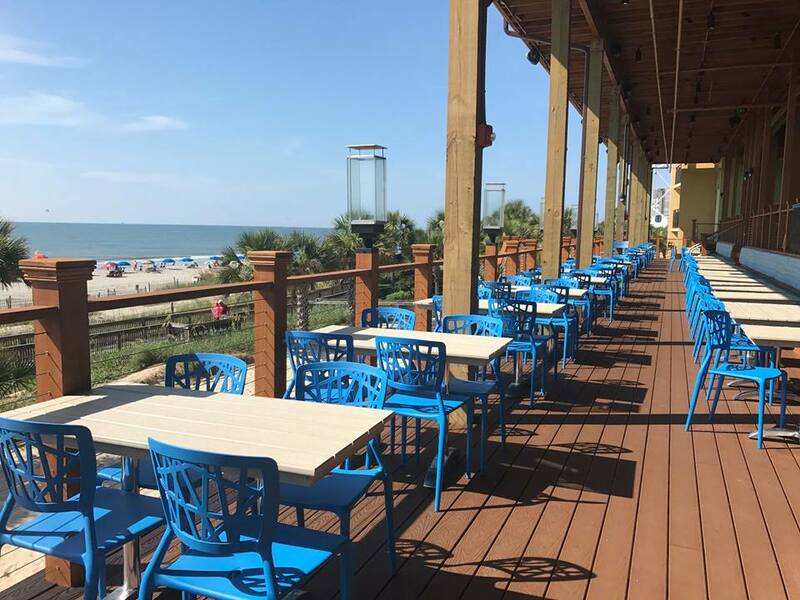 RipTydz is an oceanfront multi-level restaurant located right off the Myrtle Beach Boardwalk. Known for their specialty fruity cocktails, they offer drinks in giant mason jars and portable pouches. 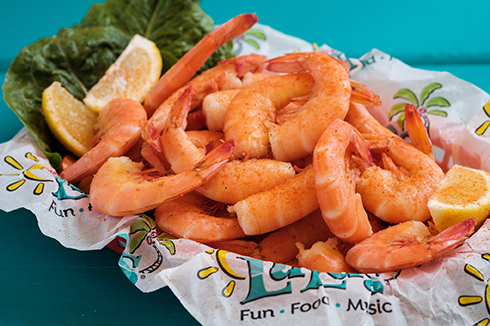 Their menu features items such as a Mac’N’Cheese Burger, Baja Steak Tacos, Seafood Towers, Sea Steamers, an Old Bay Po Boy and Shrimp and Grits. RipTydz offers an open air atmosphere with stunning views of the Atlantic ocean. 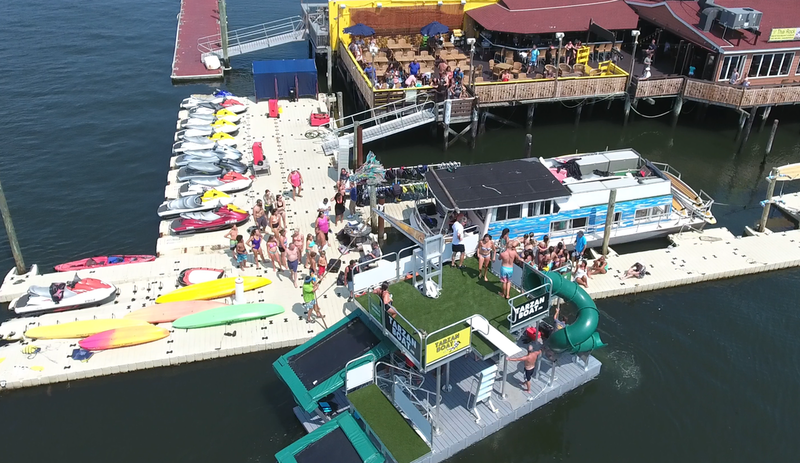 You can enjoy playing a game of sand volleyball, corn hole or relaxing with a few cocktails on the rooftop bar. You’ll definitely feel like you’re vacation when you dine here! 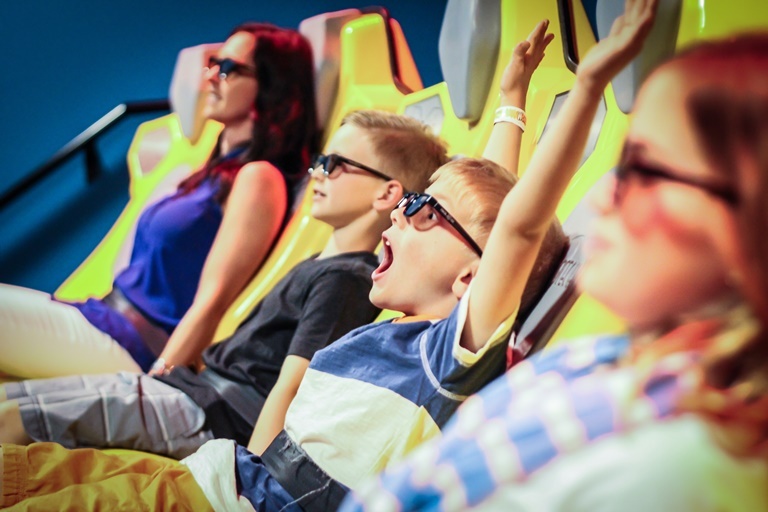 For nonstop fun and good food, check out Dave & Buster’s at Broadway at the Beach! 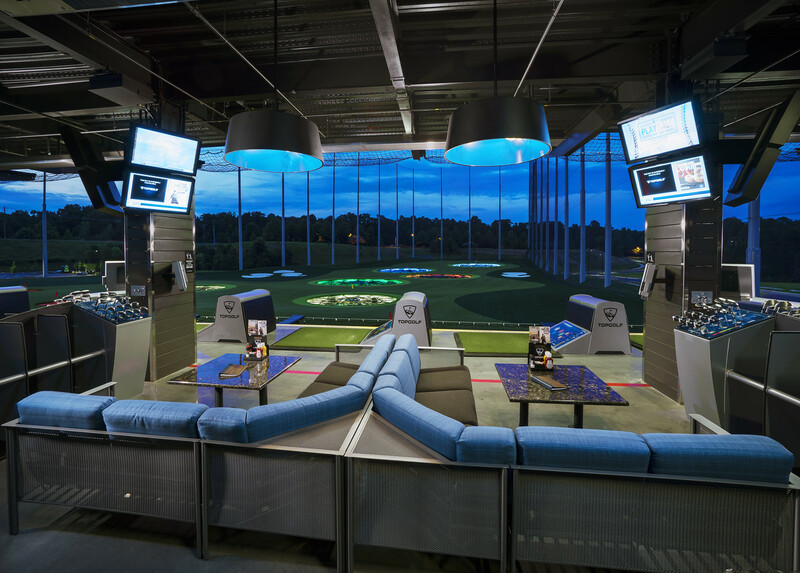 Challenge your friends and family to a round of hoops or giant Pacman and take advantage of special offers such as their Eat & Play combos which allows you to order an entree or appetizer and get a $10 power card. 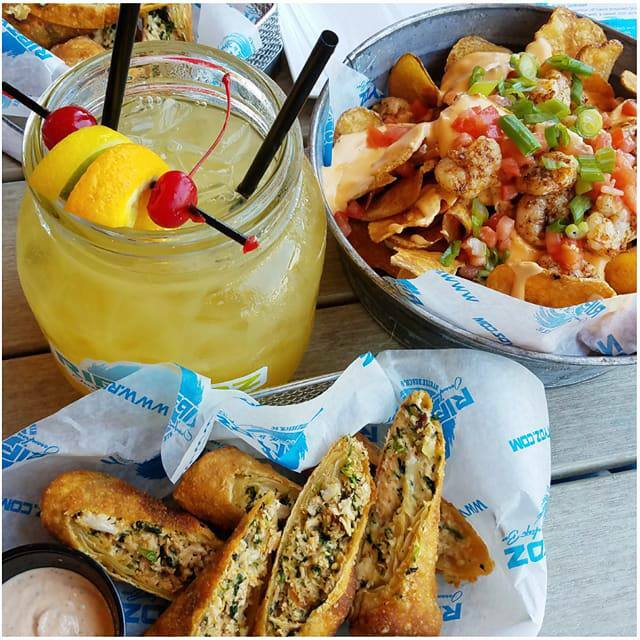 Dave & Buster’s menu features drink specials and some delicious entrees including Dave’s Double Cheesburger, Bang Bang Chicken and Spicy Thai Peanut Noodles, and Dynamite Fried Shrimp. 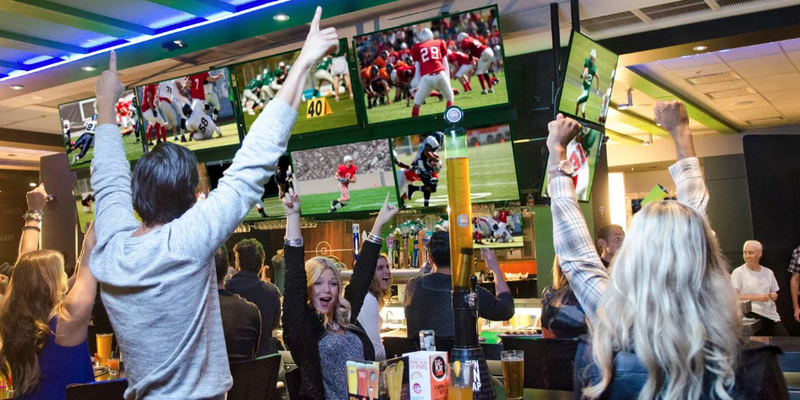 This is the place to go to watch any big sporting event. 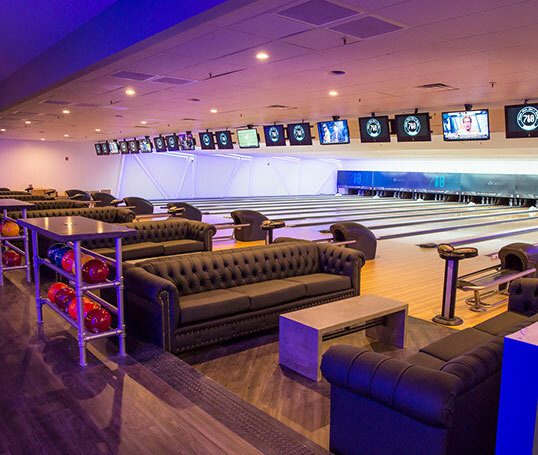 With a huge bar area filled with flatscreens Tv’s, there’s not a bad seat in the house. Who says you can’t have home-cooked meals on vacation? Located in the heart of Myrtle Beach at Broadway at the Beach, Paula Deen’s Family Kitchen is Southern cooking at it’s finest. Open for breakfast, lunch and dinner, their menu is served family-style – meaning you order a variety of hearty dishes to pass around the table. Some of the featured menus items include Chicken and Waffles, Ooey Gooey Butter Pancakes, Best Ever Southern Fried Chicken, Pepper Steak, Beef Pot Roast, Chicken Pot Pie, and Ol’Fashioned Southern Meatloaf. And of course you get a basket of warm biscuits to share! After you dine make sure to check out their retail store where you can pick up everything from t-shirts and trinkets with funny southern phrases written on them to cookware, sauces, and Paula Deen Cookbooks. Restaurant Week SC 2018 in Myrtle Beach! Myrtle Beach Restaurants featured during 2018 SC Restaurant Week! 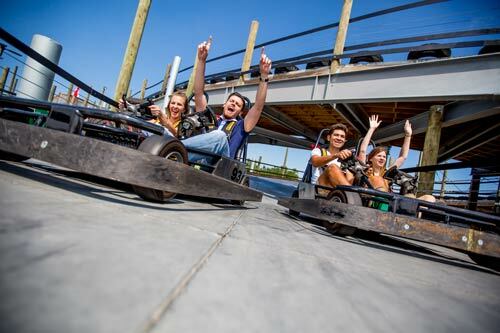 The holidays are over but the fun never ends in Myrtle Beach! Enjoy some local cuisine from some of the best local restaurants along the Grand Strand at an amazing value! South Carolina Restaurant Week, an eleven-day event that runs from January 11-21 that gives Myrtle Beach area restaurants a chance to showcase their specialty dishes at an amazing value. Participating restaurants highlight certain popular menu items, giving guests that have never dined with them a taste of what they’re missing out on. It’s also a way for loyal customers to get a special deal at some of their favorite places to eat in Myrtle Beach. Marina Inn at Grande Dunes is centrally located to several restaurants that are participating in this year’s event. In fact, you won’t even have to leave the property to enjoy a romantic meal on the water. WaterScapes Restaurant at Marina Inn Grande Dunes is an award-winning restaurant that prides itself on making the best of seasonal fare. Offering a casually elegant dining atmosphere with spectacular views of the Grande Dunes marina, WaterScapes delivers delicious entrees using only the freshest ingredients. For Restaurant Week, Chef Corbett Rourk and the WaterScapes culinary team have created a three course prix fixe menu with a choice of one item per course for just $35.00++ per person . Depending on what you’re in the mood for, it might be hard to decide between the spicy Jerk Chicken Breast with truffle potato puree and the Seared Salmon over kale with green lentil salsa. SEE FULL MENU! Conveniently located just a short walk from the main entrance of the Marina Inn at Grande Dunes is Ruth Chris Steakhouse. Ruth Chris serves top quality steak and seafood in a refined environment. This fine dining restaurant is offering a three-course prix fixe menu, as well as special deals on some of their delectable side dishes. Now is the time to splurge for an appetizer. Ducati’s Pizzeria & Trattoria, known for their Italian cuisine and mouth-watering pizza, is located right across the street from Marina Inn at Grande Dunes. This little restaurant with a quaint Italian café atmosphere packs a lot of authentic flavor into their dishes. Ducati’s has designed a three-course prix fixe menu, giving you the option of choosing one item per course. It might be hard to pick just one – especially when one of the dessert options is homemade Limoncello Cake! The newest restaurant in the group is Hook & Barrel. The award winning chef of Croissants Bistro and Bakery opened Hook & Barrell this summer with an eclectic menu. Hook & Barrell is within a five minute drive of the Marina Inn at Grande Dunes. There are other top-notch restaurants participating in this tasty event located all along the Grand Strand. 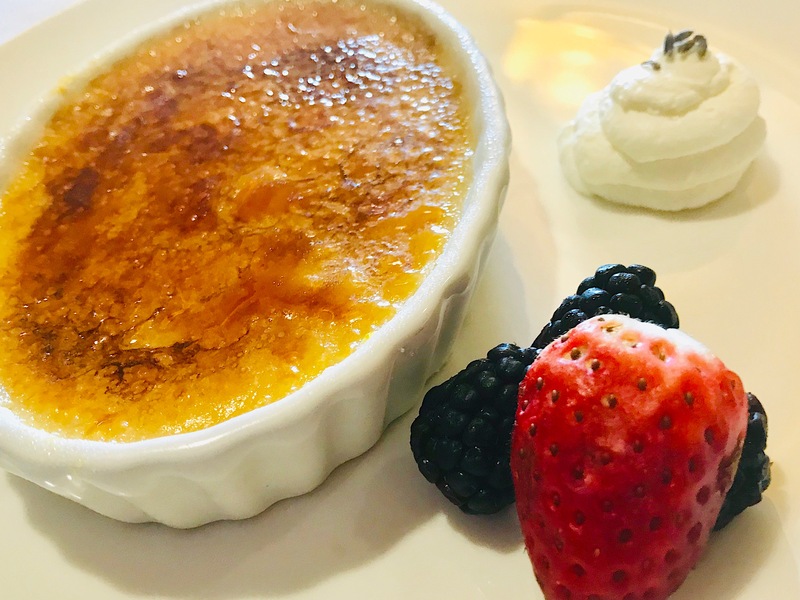 These restaurants include the French inspired menu at Brentwood Restaurant & Wine Bistro in Little River, The Parson’s Table – also in Little River, Aspen Grille, Angelo’s Steak and Pasta and much more! Creme Brulee is one of our dessert choices at WaterScapes Restaurant. Boasting some of the top restaurants in the Southeast, from upscale to casual dining, this is your opportunity to sample some of the best fare that Myrtle Beach has to offer. So whether you’re a seafood enthusiast, steak lover or crave Italian – there is something to satisfy everyone’s palate. 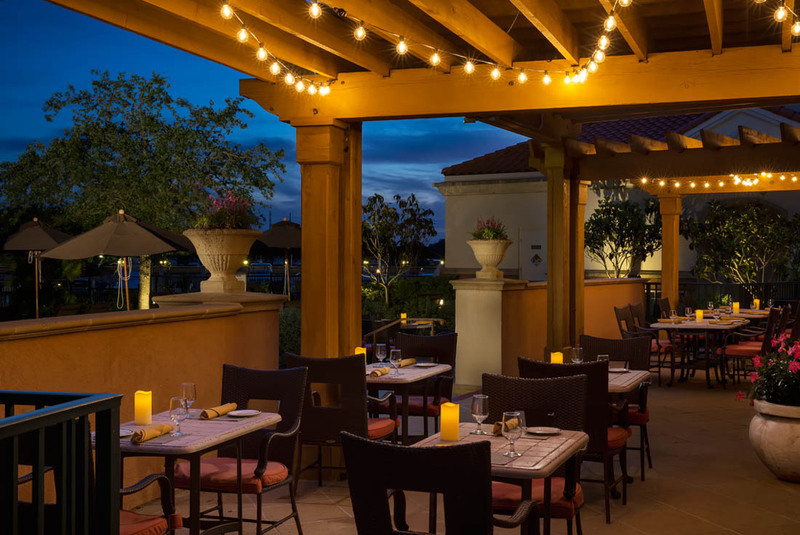 While dining at WaterScapes Restaurant; make it a staycation at the Marina Inn at Grande Dunes so that you can try out all of the participating restaurants then enjoy a relaxing evening in one of our luxurious rooms or suites. Check out our Winter Special Offers now! Click Here for a full list of participating restaurants as well as up-to-date promotions and menus and be sure to pack an appetite and share your dining experiences during restaurant week with #rwsc. One of the Best Restaurants in Myrtle Beach is at the Marina Inn at Grande Dunes! 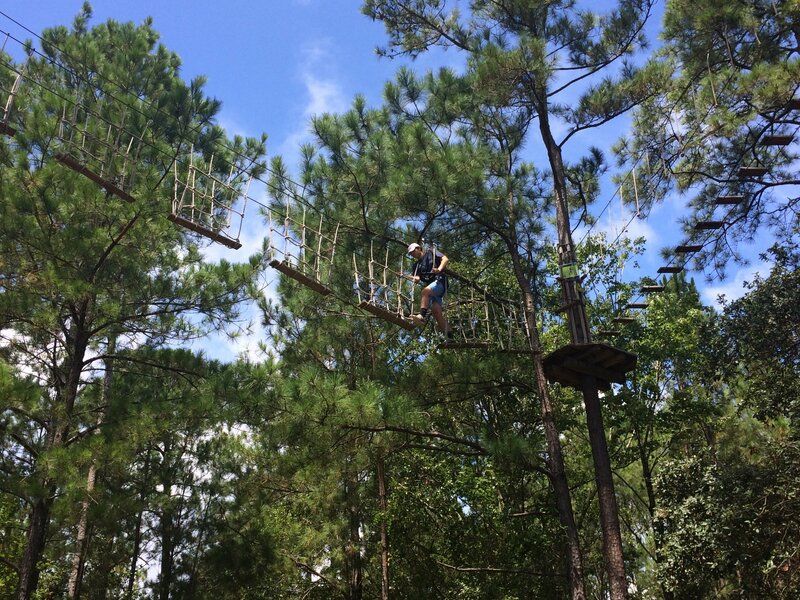 Top Culinary Experience in Myrtle Beach-WaterScapes! Next time your looking for the best resturant in Myrtle Beach – look no further than the award winning WaterScapes Restaurant. for a unique Myrtle Beach culinary experience. Conveniently located at the luxurious, four-diamond Marina Inn at Grande Dunes, it has received several accolades such as named one of theTop 5 Low Country Restaurants in Myrtle Beach, TripAdvisor’s Certificate of Excellence, Open Table’s Diners Choice and more! WaterScapes’ dedication to both being at the forefront of sustainability and providing guests with meals made from fresh, local products has made them one of Myrtle Beach’s top restaurants. Combine your love of seafood and upscale dining for an unforgettable dining experience. This elegantly casual restaurant in Myrtle Beach offers both indoor and outdoor seating options. You can enjoy the ambiance of the beautifully lit waterfront dining on the outdoor patio as you overlook the pool and watch boats glide by along the waterway. The indoor dining is in a beautiful, open room adorned with crisp white table cloths and elegant decor. Private Dining Room for Intimate Celebrations! If you have a big birthday coming up or want to celebrate your anniversary, our private dining room is an elegant option with inside seating of up to 30 guests an a patio for outdoor dining. Book the private room by contacting WaterScapes directly at 843-913-2845. WaterScapes is known to the locals for a unique dinner experience but don’t forget we are open daily for breakfast, lunch, and dinner – so it’s available to fulfill your dining needs anytime of day. Start your day off right with a mouth-watering omelette, fluffy pancakes, and a hot cup of coffee between 6:30 am and 11:30 am. Spice up your lunch routine with a delicious reuben sandwich or grilled chicken ciabatta between 11 am and 2 pm. End your day with a succulent grilled filet mignon or seared salmon for dinner. Dinner is served between 5:30 pm and 10 pm, and while reservations are not required, they are highly recommended – especially during the peak summer season. Nightly seafood or steak specials may be available in addition to the regular menu. WaterScapes offers an extensive Wine List so dont forget to ask for the perfect pairing for your meal! We are kid friendly offering all of their favorites on our Kids Menu. Top off your evening with our dessert special. Ask your server about the latest fresh dessert offering. Reservations are available by calling Waterscapes directly at 843-913-2845 or at opentable.com. Meet Executive Chef Corbett Rourk! Chef Corbett Rourk is the executive chef at WaterScapes Restaurant and is a South Carolina native who’s Charleston, SC restaurant cooking style combines classic French training with a unique southern twist! With over 25 years of culinary experience working for a variety of restaurants, each dish he creates at WaterScapes is a treat for the taste buds. Chef Corbett Rourk has always felt his calling was to prepare the freshest meals with local products, making WaterScapes the perfect home for him. When you look over the menu, it’s easy to feel overwhelmed by the seemingly endless choices of mouthwatering meals. Whether you’re vegetarian, gluten free, or just slightly selective when it comes to eating, at WaterScapes, your options are still endless. Satisfy your seafood craving with the white clams and pasta dish which features a creamy white clam sauce, cherry stone clams, semolina pasta and crostini. As the weather cools down, the perfect way to warm up is with a hearty bowl of sweet corn and potato chowder. This dish features bacon and red pepper chantilly and can is served as either a cup or a bowl. If you’re searching for vegetarian-friendly options for dinner, the Sweet Potato and Spinach Roulade or Brown Butter Gnocchi are definately worth a try. For lunch, the Fried Green Tomato Sandwich is option with a local flair! 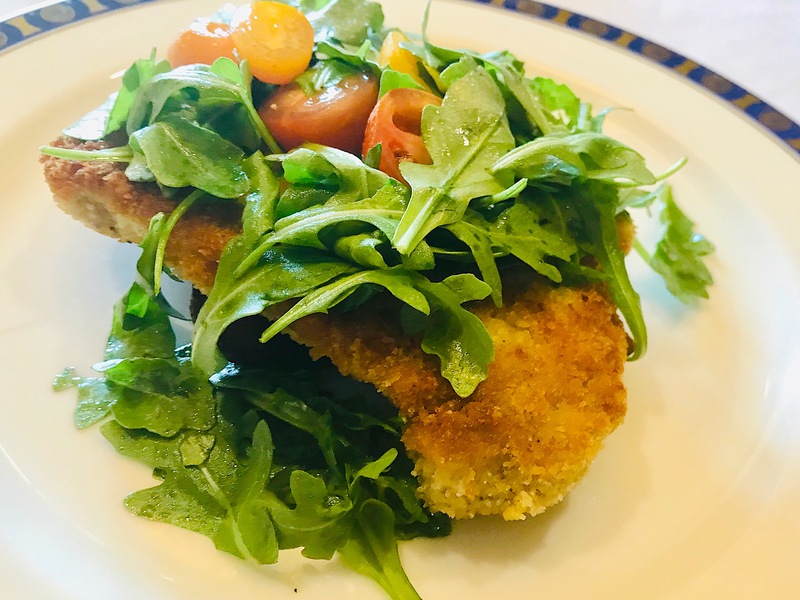 This healthy lunch item has crispy green tomatoes, creamy goat cheese, arugula, and shaved red onions – all served on delicious sourdough bread. 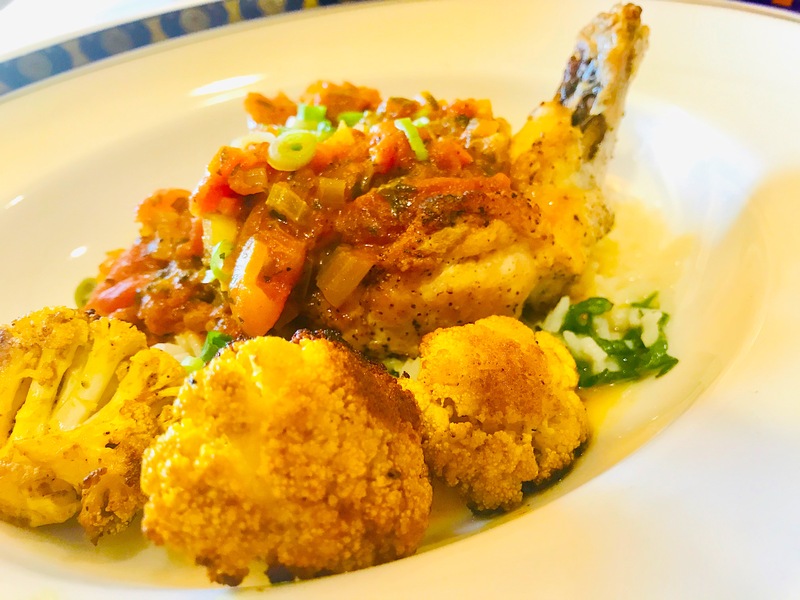 WaterScapes also offers gluten friendly dinner selections such as Jamaican Airline Chicken, Shrimp & Grits, Grilled Filet Mignon or Char Grilled Filet. For lunch there’s the Sweet Corn and Potato Chowder or WaterScapes Caesar Salad. WaterScapes utilizes a “Farm to Table” style cooking method and prides itself on sourcing locally. The local produce from Lee’s Market in Murrells Inlet, SC is used to prepare certain dishes, as well as pork products from Benton’s Country Hams from Madisonville, Tennessee. When you order grilled local shrimp & grits – you’re feasting on southern grits from Anson Mills, a Columbia based business. Other local dishes include the char grilled ribeye and pan seared diver scallops, to name a few. Myrtle Beach is well known for an abundance of activities but it also has a soft romantic side for your honeymoon in Myrtle Beach! Between the amazing attractions, assortment of restaurants and yes, the beach – it’s the perfect spot to escape to after saying “I do”! Myrtle Beach is centrally located and easy to get to if your are flying into Myrtle Beach International Airport or driving. After your big day, we have you covered! Treat yourself to a honeymoon of luxury and reserve a suite at one of the top 5 star resorts in Myrtle Beach – Marina Inn at Grande Dunes. Our resort is highly coveted as the best romantic experience in Myrtle Beach. We are a resort that spares no expense when it comes to making sure you have a first-class stay. Our guest rooms and suites are large and luxurious with private balcony with views from every room. You will not want to leave your room! But if you do, we are located on the beautiful Intracoastal Waterway and feature amazing amenities including: a private beach, our location beside Myrtle Beach Water Sports for easy access to rent jet skis or a pontoon boat (March – October), outdoor pool with infinity edge entry, indoor pool and fitness center, tennis, spa the Grande Dunes Resort Golf Course is located onsite. This is the more extravagant of the two packages and includes everything you need to start your next chapter as a couple in Myrtle Beach. Accommodation of choice of the most luxurious room – these include suites that have private balconies with stunning views of the Intracoastal Waterway. You’ll feel pampered as you relax in our complimentary soft cotton bathrobes and sleep like royalty on our Egyptian cotton bed linens and down pillows. Ask for the “Studio Suite Deluxe” that feature Jacuzzi tubs. Book early because these suites go quickly! On arrival night, enjoy a chilled bottle of Domaine Ste. Michelle sparkling wine and an assortment of chocolates along with an exquisite Gilchrist & Soames Spa basket full of luxurious products to pamper yourselves throughout your stay. Choose which night to experience a romantic three-course dinner for two at our award winning restaurant WaterScapes. Also choose which day or night to relax with a one-hour “Couples Hot Stone Massage” in the privacy of your guest room – so you can be pampered without having to even leave your suite. Accommodation of choice of the most luxurious room – these include suites that have private balconies with stunning views of the Intracoastal Waterway. You’ll feel pampered as you relax in our complimentary soft cotton bathrobes and sleep like royalty on our Egyptian cotton bed linens and down pillows. Our “Studio Suite Deluxe” feature Jacuzzi tubs – adding that extra romance to your experience. Start each morning with a full delicious breakfast in our award-winning restaurant WaterScapes Restaurant. Choose which night to experience a three-course dinner for two at our award winning restaurant WaterScapes Restaurant. 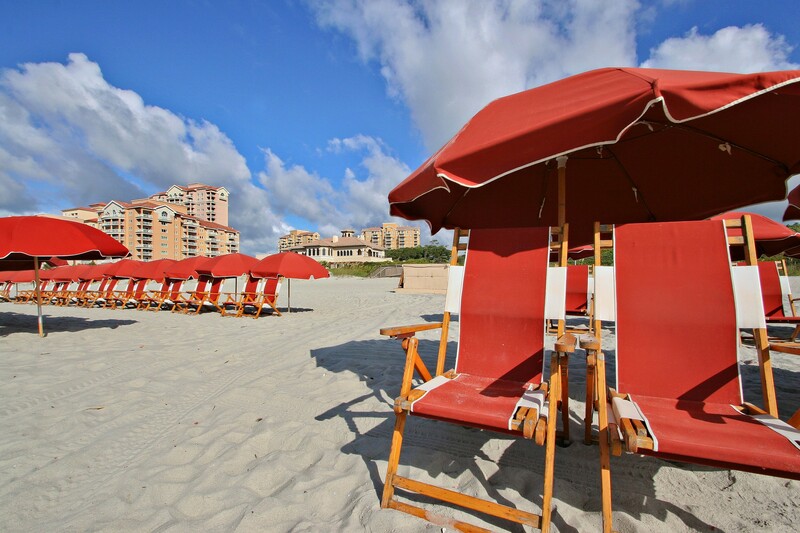 Relaxation is waiting for you! There’s Life Outside of the Resort! 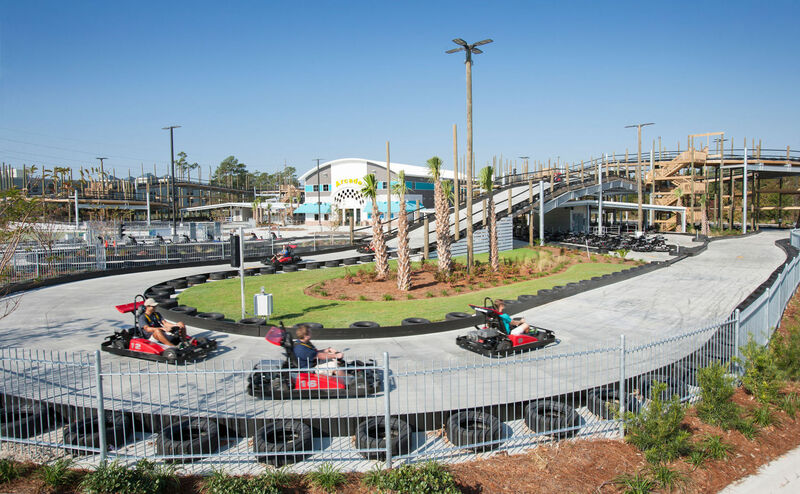 Should you get antsy lounging by the pool or our private beach, there are plenty of activities to entertain yourselves along the Grand Strand while spending some quality time together. Want to spend an afternoon sampling wine? Duplin Winery is located right up the road and features tastings Monday-Saturday from 11 am to 5 pm. You’ll learn about the family history of the winery and see the bottling process in action. Once you find a Muscadine wine you enjoy – there is a beautiful outdoor patio to sip and relax with your sweetheart. Make sure to grab a bottle or two for a souvenir to enjoy when your honeymoon is over. If you prefer beer rather than wine, you can check out Myrtle Beach’s only microbrewery – New South Brewing. Located in the heart of Myrtle Beach, this brewery is passionate about their craft beer and they offer tours so you can get a behind-the-scenes look at the brewing process and sample up to 5 of their beers. It is such a small brewery that you’ll get the opportunity to see first-hand how they hand-package every six-pack. Once your tour is complete, stick around and enjoy some of their delicious craft beer on tap. And you can even fill up a growler of your favorite beer for a tasty souvenir. Brookgreen Gardens is a romantic place to explore. You can wander and meander through the gardens full of blooming seasonal flowers and admire all the handcrafted sculptures. 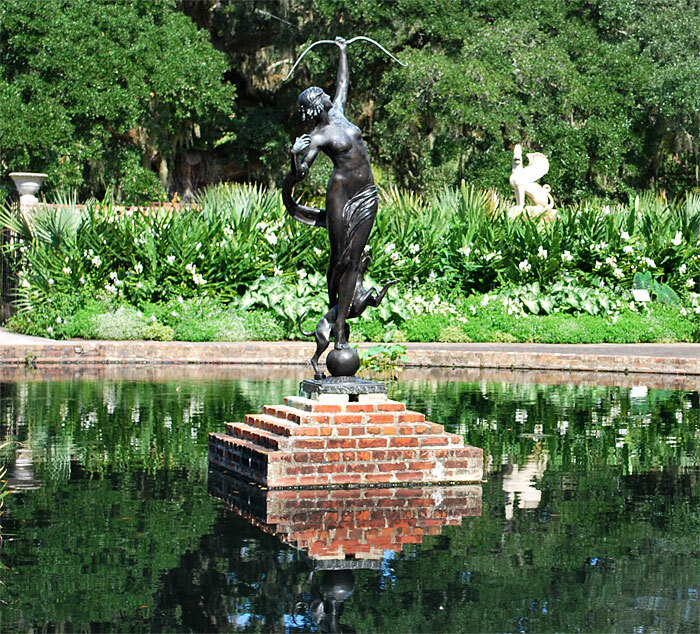 Brookgreen Gardens is known for having one of the largest collections of American figurative sculptures in the country. There are over 1,400 pieces crafted by 350 different artists. You can also visit the onsite zoo and, if you’re honeymooning in the summer months, be sure to check out the Butterfly House – a magical exhibit where hundreds of butterflies flutter through the air. If you’re newlyweds that are looking for activities with a little more excitement – you can try taking a surf or paddle boarding lesson. And if you want to get above the surf and soar above the waves, try out parasailing. 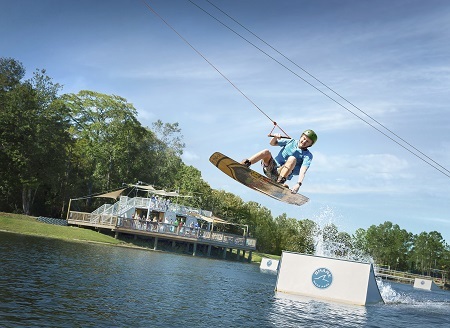 Try Jack’s Surf Lessons & Board Rentals – located close by in Myrtle Beach they offer surfing lessons, board rentals, Stand Up Paddleboarding and kayaking. Or for a laid back afternoon in Murrells Inlet, you can rent kayaks or Stand Up Paddleboards and experience the beauty of the marsh up close and personal. Seafood Dining in Myrtle Beach! Myrtle Beach is home to some of the best restaurants and amazing seafood. To experience an award-winning dining experience at one of the Top 5 Lowcountry Restaurants in the state, you won’t even have to leave the property. WaterScapes Restaurant is well known for its intimate dining atmosphere with cuisine prepared by award-winning Chef Corbett Rourk. 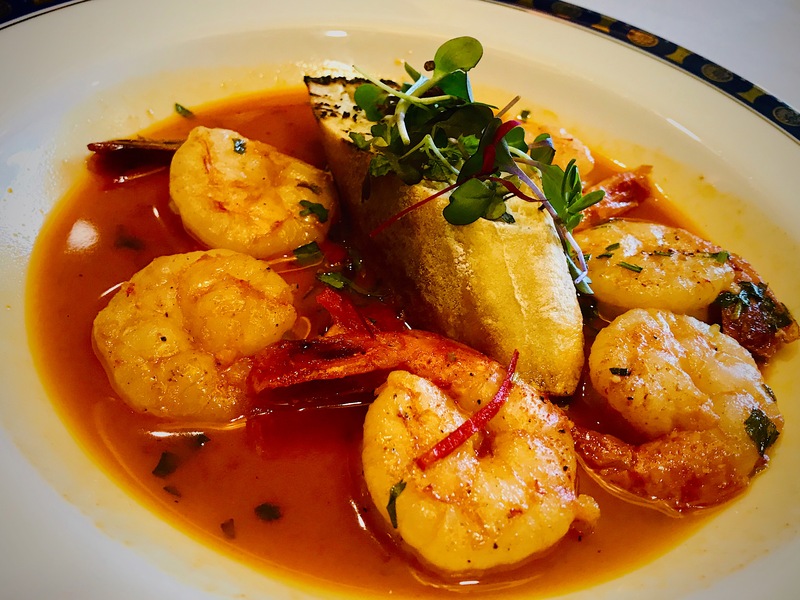 Specializing in seafood and steaks, try the latest seafood selection such as diver scallops or shrimp and grits or a grilled filet or char grilled ribeye. Just a few steps from our door is the nationally known Ruth Chris Steakhouse. They feature aged beef and top-quality ingredients with their a-la-carte style menu. For a unique, upscale local dining experience, check out Collector’s Café – an art gallery/restaurant. You’ll enjoy delicious cuisine among amazing pieces of art. Featuring beautiful paintings, stunning photography and amazing sculptures – all of which are for sale. The owners, Tom & Craig are among the artists. You will probably see one or both of them there! Just around the corner in the same building as Collector’s Cafe is Fire & Smoke Gastropub. 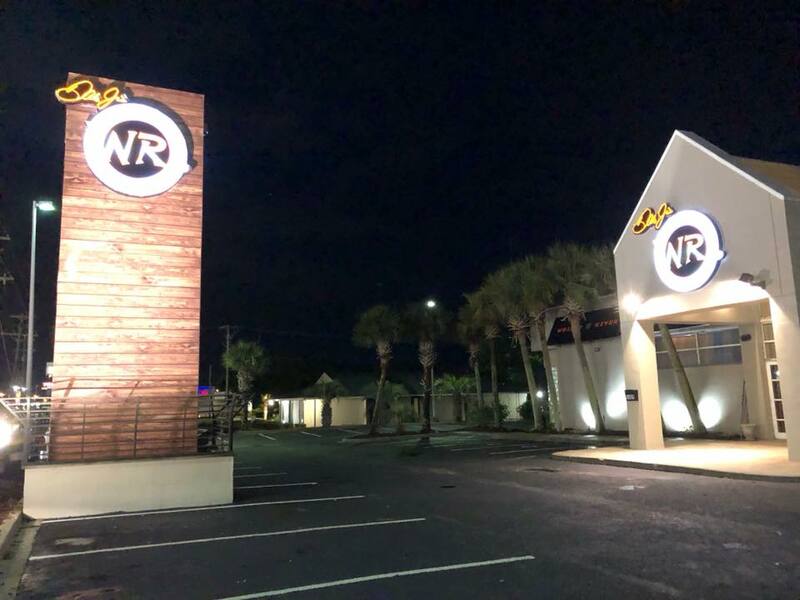 Local owner & Chef Tyler Rice has created an amazing, versatile menu that you won’t find anywhere else in Myrtle Beach using a wood-fired grill and hot an cold smoker for beef, lamb and pork. Try small or large plate servings. Just across the street from these two restaurants, a fun place to grab an after dinner drink or some tapas is the intimate Boom Boom Wine Room. Try their “wall of wine” where you purchase a hotel-style keycard, that you load with money – your “key” to purchasing wine. There is a various assortment of wines to choose from – both red and white – and you can either select a sip, sample, or pour. There is usually live music and it is a great atmosphere to sample some new wine and enjoy each other’s company. If you’re looking for a classic, local seafood restaurant, you’ll have to try the Sea Captain’s House. It’s the perfect place for breakfast, lunch or dinner. On Sundays they even feature an award-winning brunch. Not only is the food they serve outstanding – but they’re located right on the ocean in a historic house– so the views while you dine are amazing. As you can see, Myrtle Beach has so much to offer newlyweds and is an amazing place to spend time together for your Special Honeymoon at the Marina Inn at Grande Dunes! We invite you to book one of our luxurious honeymoon packages for an unforgettable memory! 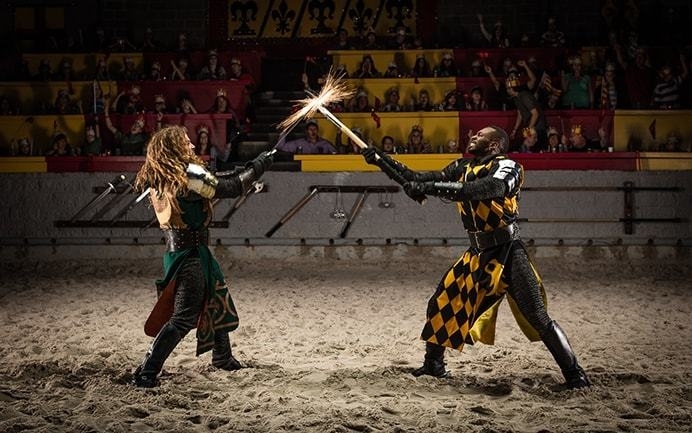 Looking for Valentine’s Day Romance in Myrtle Beach? With Valentine’s Day fast approaching, it reminds us how important it is to spend time with our loved one and is the perfect opportunity to consider a romantic getaway to one of the southeast’s top romantic locations – Myrtle Beach, SC. The Marina Inn at Grande Dunes located on the northeast coast of Myrtle Beach is a renowned location for couples seeking a romantic getaway Check availability of our Studio Deluxe Suite. This intimate, secluded suite features a king size bed facing cozy fireplace. This suite also features a luxurious marble Jacuzzi; perfect for relaxing after a day of exploring the Myrtle Beach area. Then enjoy a glass of wine on the spacious, private balcony overlooking the serenity of the golf course and waterway. These suites are in high demand so early reservations are encouraged! In honor of Valentine’s Day, take advantage of our relaxing Bed & Breakfast Package for your romantic weekend escape. You can begin each morning with breakfast in your cozy bed or enjoy your meal sitting on the balcony overlooking the stunning Intracoastal Waterway. Wherever you choose to dine in your suite, you can enjoy any item off the extensive breakfast menu from WaterScapes Restaurant. After breakfast, you still won’t have to leave your room with our “In Room Massage” service. Your massage therapists will arrive directly to your suite for a calming side by side “Couples Massage” while you both share in the relaxation of a therapeutic massage. Once you’ve spent the morning indulging in breakfast in bed and getting pampered, you can spend the rest of the day doing nothing but lounging around the suite in your cotton bath robes. 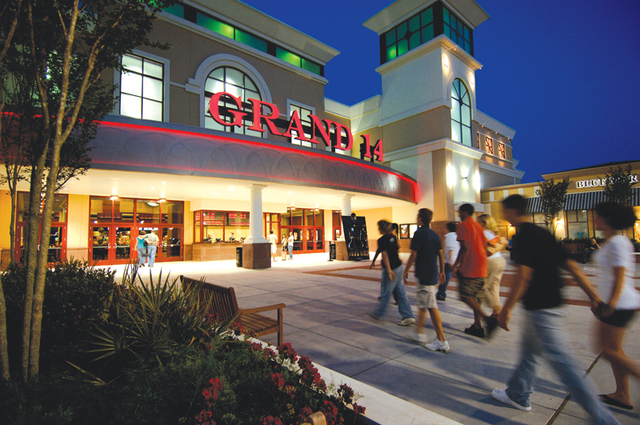 If you decide to venture outside of the Grande Dunes Resort, there are plenty of romantic activities to entertain yourselves in the afternoon. Traveling just 5 miles north or the Marina Inn, spend some time meandering through the boutique shops at Barefoot Landing. Make sure you stop in to Duplin Winery and sign up for a tasting that’s available from 11 am to 5 pm Monday-Saturday. You will learn all about the Duplin family history as well as watch the bottling process as you and your sweetheart enjoy sipping on the delicious flavors of Muscadine wine. Muscadine grapes are native to the Carolinas and offer a unique flavor not found anywhere else. Browse the unique retail store and be sure to purchase a bottle or two to take home. Right across the street from Barefoot Landing is a perfect spot to grab a quick bite to eat for lunch. One of the newest dining experiences is Nacho Hippo. Don’t expect to find the ordinary taco fare at this open air cantina! They are known for their funky “hip” taco selections such as the “Kamikaze” that includes seared tuna, lettuce, seaweed salad, wasabi jalapeno mayo and Japanese pepper blend. Or the “Thai One On” – spicy red curry chicken, spring roll slaw, toasted coconut and Thai peanut sauce – just to name a few. They also serve up a “hip” nacho selection piled high with toppings, definitely a large enough portion to split between the two of you. Don’t count out their beverage selections…be sure to try one of their spicy jalapeno margaritas! For an afternoon adventure, travel south about 30 minutes to Murrells Inlet, SC. The weather is usually mild this time of year so you can enjoy some salty air breezes on the Murrells Inlet Marshwalk. This ½ mile wooden boardwalk meanders along a natural saltwater estuary. Watch the local fishing boats come in with their latest catch and stay camera ready for the chance to snap a glimpse of a blue heron catching his lunch, pelicans flying by or other unique sea life along the walk. Complete your visit with an afternoon cocktail or fresh seafood snack at one of the many quaint restaurants that line the boardwalk. Once you’ve finished exploring for the day, you’ll want to wind down back to the Marina Inn at Grande Dunes over a romantic dinner for two at WaterScapes Restaurant. 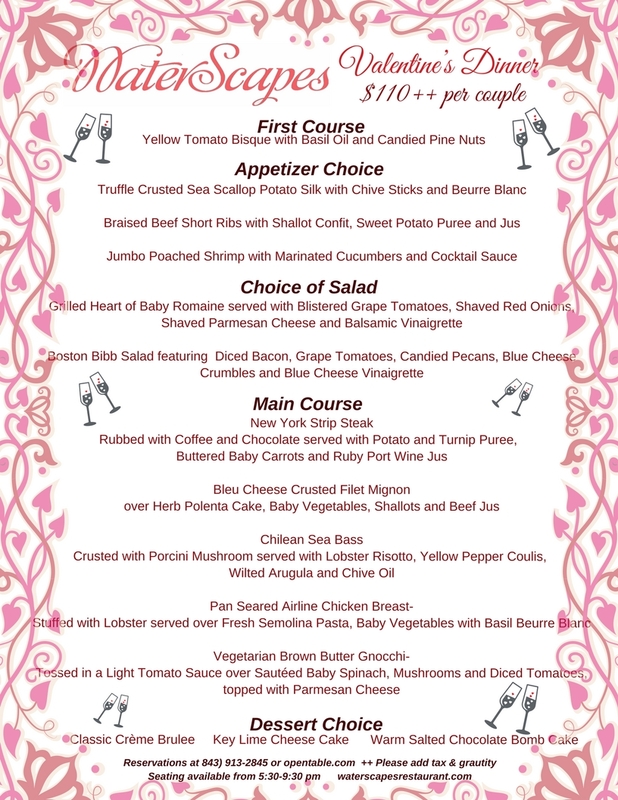 If you are vacationing over Valentines Day, Chef Corbett Rourk has created a succulent five-course Valentine’s Day Menu available from 5:30-9:30pm. WaterScapes offers a secluded, romantic atmosphere in a relaxed setting. It’s the perfect way to end the day with your loved one – dining over a delicious meal and an amazing bottle of wine in a cozy atmosphere. So if you’re ready to escape to Myrtle Beach and book your romantic Weekend Getaway with us at Marina Inn at Grande Dunes, click here for more information on the Bed & Breakfast Package.